The 4-day workweek. The 4-hour work week. Sounds really nice, doesn’t it? Who wouldn’t want to work 4 days every week and then play for 3 days? It’s not surprising that tens of thousands of books have been written about efficiency, about working less, about being more productive, about getting more out of your day, etc. There are countless of blog posts written about this too, although I believe Seth Godin is spot on when he wrote in his blog two days ago that too much today is written simply to get the post noticed, not to offer anything of real value. We can all agree that sleep deprivation is not a badge of honor (except maybe for a select few type-A personalities). The reality is that it’s far easier to say “work smarter” than to actually figure out how to do that from the start. And this is especially challenging for start-ups (in any industry). After all, there is also the reality of operating a business – any business (except perhaps for those lucky businesses who after many years have successfully found a great balance between work and play). Sometimes, the ideals of a short week are more fantasy than reality. Sometimes, ideals can’t replace hard work. And there’s absolutely nothing wrong with working hard when one must. 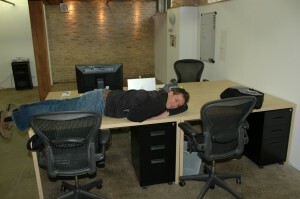 Below is a photo of Pete Burgeson, crowdSPRING’s Director of Marketing, at around 4:50 a.m. the morning we launched into private beta in March 2008. The smile on Pete’s face, after many loooooooong days and week says it all.